Leading productive and inclusive meetings is always a challenge. Type in “meetings are…” in Google search and one of the first results that you’ll see is…”a waste of time.” It’s true that the value of a meeting can often rest in the hands of people, but at Google, we believe the technology is equally important to a meeting’s success. About a decade ago, we set out to learn what makes a meeting effective at Google and took what we learned to create solutions that help Googlers collaborate more efficiently. Our research s howed that if people really want to get work done, they need flexible tools. As a result, we shifted our company’s meeting culture away from conference calls and adopted a video-first approach to collaboration. This journey also informed the foundation of our meeting solutions in G Suite, which we’ve built out to include video conferencing that can host up to 100 people at one time (and 100,000 on livestream), dynamic, cost-effective hardware that’s smart enough to troubleshoot its problems, and intelligent, interactive whiteboards to foster creativity in your meetings. Today, we are announcing new partnerships to bring your business more options for meeting technology and to make meetings even better. Huddle room bundle (ideal for 2-6 people) with a Logitech Meetup conferencecam with built-in microphones and speakers, a Chromebox and Logitech Tap touch controller. Medium room bundle (best for 6+ or more people) with a Logitech Rally camera, speaker and mic pod, a Chromebox, and Logitech Tap touch controller. Large room bundle (ideal for 12+ or more people) with a Logitech Rally system, including a Rally Camera, two speakers, two mic pods and a Chromebox with Logitech Tap touch controller. With Logitech Room Solutions for Meet, organizations can power high-quality video meetings at a fraction of the cost of typical systems (bundles start at $3,000). Employees can also easily collaborate with colleagues through close integrations with other G Suite apps like Calendar. Most importantly, IT admins and A/V professionals can have peace-of-mind knowing that the bundles include built-in, enterprise-grade support. These bundles will be made available in early Spring. Sign up here if you’d like to learn more. Two years ago, Acer introduced Acer Chromebase, the original all-in-one device designed to host meetings for businesses. 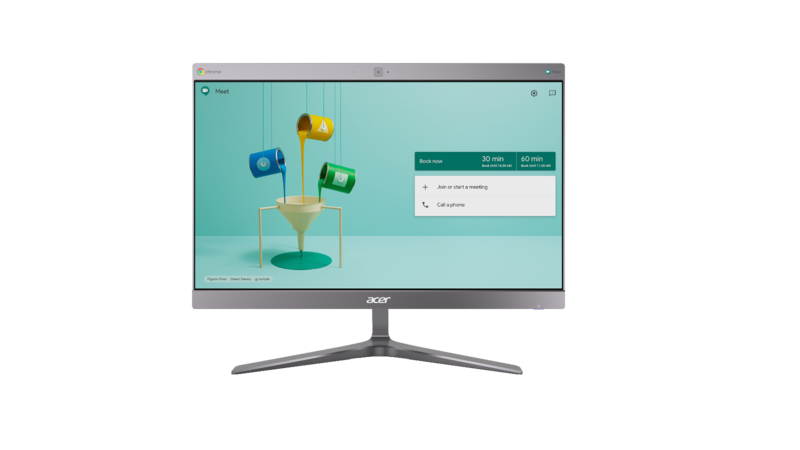 Building on its success, we are partnering with Acer to introduce a 24” all-in-one device specially tailored for Hangouts Meet called the Acer Chromebase for Meetings 24V2. This desktop device will include a wide 100-degree field of view camera (perfect for 1-2 person huddle rooms and video phone booths) and comes equipped with an extra USB-C port. The Acer Chromebase for Meetings 24V2 is easy to deploy, as well, so IT teams can get their employees up-and-running quickly. Starting at $999 USD, you can purchase this device this summer. At the end of the day, people are at the heart of healthy and successful organizations and teams are most effective when they connect face-to-face to solve problems. We believe that all organizations, small or large, can have a video-first meeting culture, which is why we’re building solutions that help companies reimagine meetings. At the same time, we also understand that every organization has different needs. To help transition your company to be video-first, we’ve created an interactive guide to help you plan, design and deploy the best meeting room experience for your business. You can also contact sales to learn which options are best for you. We’re highlighting these new devices and our meeting room solutions like Jamboard at Integrated Systems Europe (ISE) in Amsterdam this week. If you’re onsite, stop by Hall 15, U265 and check us out.